The next hand pieced block on the list was the Shoo-Fly but since I had just finished the Bear Paw, I wanted a bit of a break from itty bitty piecing and chose the Card Trick instead. Relatively speaking, this is a fun and easy block and I love the way it turned out. I’m not sure why I chose coral for the background of this block, I had pulled it with the intention of using it in my Granny Square skirt. There is a tiny bit of orange in the Denyse Schmidt dot fabric and I love orange/pink/red together. This entry was posted in Fabric, Hand Pieced, sew along and tagged Bonnie & Camille, Card Trick, Denyse Schmidt, Why Not Sew by Tabatha. Bookmark the permalink. 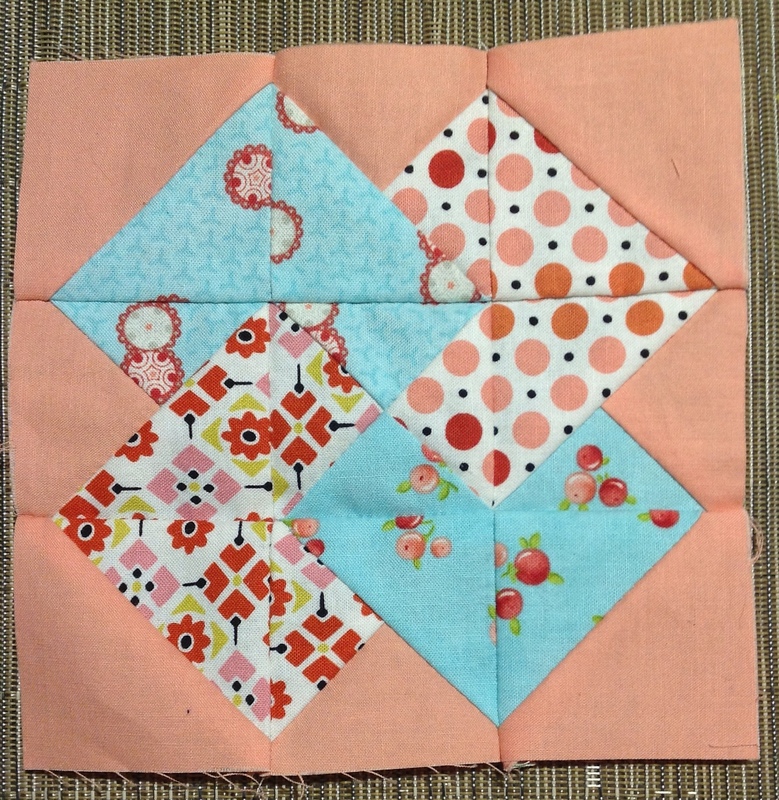 looks great Tabatha, I sure wish I could get my dear jane blocks to turn out the right size………..
That’s why I’m using the tutorial at Why Not Sew, makes it so much easier! Looks good! I love the color combo. This is also a small block? Thanks Candy! Yes, this is another 6″ x 6″ block finished.